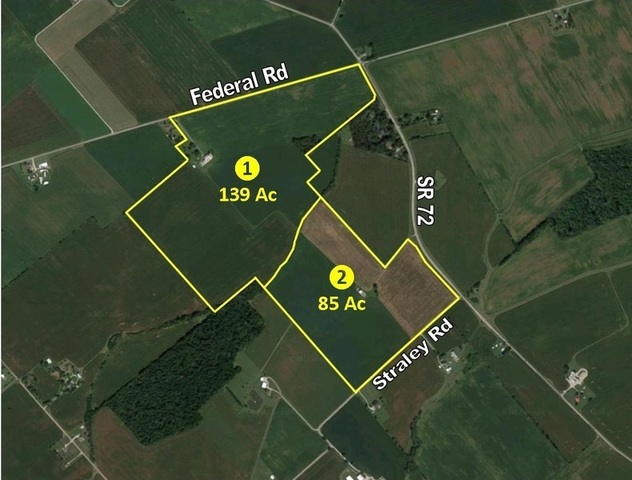 A great opportunity to purchase productive land in the fertile area of eastern Greene County between Cedarville and Jamestown. The Straley family has farmed and managed this beautiful property for decades and is now ready to pass it on to the next generations. Including over 212 acres of tillable land with excellent producing soils, this property has produced great yields for many years. This farm provides excellent access to US 35, I-675, I-70, & I-71 and good road frontage on both Federal and Straley Roads. An east-west drainage ditch between Tracts 1 and 2 provides excellent tiling outlet possibilities on both tracts. Tract 1: 139.5 acres located at Federal Road and SR 72. Features 130.8 tillable acres, gravel lane access, and well and septic from former home site on Federal Rd. Tract 2: 84.9 acres of unimproved land located at Straley Road and SR 72. Features 81.3 tillable acres. Click on “Documents” for complete Bidder Package and Auction Brochure or contact us today to learn more about this exciting opportunity to invest in some of Southwest Ohio’s best farmland! Bidding Procedure: The properties will sell to the highest bidder(s) via the Multi-Parcel Auction Method and subject to confirmation of the Sellers. Down Payment: Purchaser(s) will deposit $50,000 per tract as down payment with the Auction Company on the date of auction upon signing of Confirmation of Sale Agreement; balance due at closing. Closing Date: On or before June 30, 2017. Purchaser will pay customary portion of closing costs at closing. Closing(s) will be conducted by Greene County Title Agency in Xenia, Ohio, unless otherwise agreed to by Sellers & Purchaser(s). Possession: Date of closing with tenants in possession rights reserved to harvest 2017 crops. Survey: Seller will provide a new survey for each tract conveyed. Cash Rents: All cash rents for 2017, totaling $42,500, will be distributed to the Purchaser(s) based on the following schedule: (1) cash rent division between Tracts 1 and 2 will be prorated based on FSA acreages of 130.8 and 81.3, respectively; (2) monthly rents of $3,000 paid as of the date of closing will be credited to the Purchaser(s) at closing; (3) all additional rents will be paid directly from the tenant to the Purchaser(s) for totals of $3,000 per month through September, $5,000 per month in October and November, and a final payment of $5,500 in December.